The House of Representatives on Thursday stated that a former president, Olusegun Obasanjo, is the grandfather of corruption in the country, accusing him of introducing corruption to the National Assembly on its first working day in 1999. But addressing journalists, the Chairman, House Committee on Media & Publicity, Hon. Abdulrazak Namdas maintained that Obasanjo has no moral authority to discuss corruption, adding that he wants to bring down Buhari’s government and that he is “acting as lifetime opposition leader, blackmailer”. 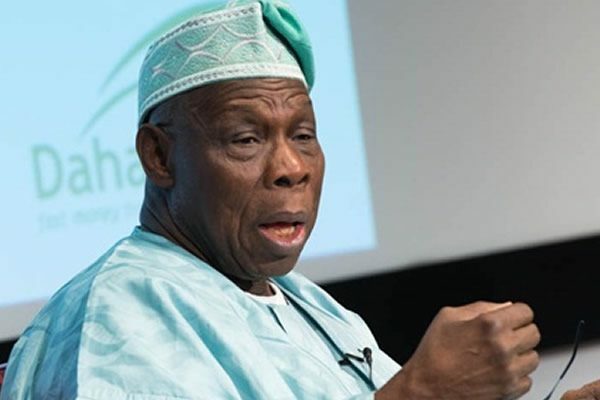 In the words of Namdas, “Our attention has been drawn to a statement credited to former President Olusegun Obasanjo at a lecture he delivered recently, wherein, in his characteristic manner accused everybody but himself of corruption. INamdas said the House would ordinarily not join issues with the former President as he has held an office that deserves respect and reverence. “However, because of the material misstatement of facts, outright lies and falsehoods, and mischievous innuendo introduced in his statement, we are left with no option but to correct him. “We have repeatedly maintained that there was no “padding” of the 2016 Appropriation Act, which is a legitimate document passed by the National Assembly, authenticated by the Clerk to the National Assembly as provided in the Acts Authentication Act and assented to by Mr. President. It is most unfortunate that a former President of Chief Obasanjo’s stature would allow himself to be hoodwinked and procured by a renegade member of the House, who embarked on massive propaganda and lies just because he was removed from office. “He claimed that the National Assembly Budget is very high, when by all standards, the National Assembly is grossly underfunded and is hampered from effectively and legitimately carrying out its constitutionally assigned functions. The National Assembly Budget funds a bureaucracy of about 5,000 civil servants. It has some other agencies under its preview such as the National Assembly Service Commission with its own staff of about 500; even the Public Complaints Commission is now a parastatal of the National Assembly. “National Assembly Budget also funds the National Institute for Legislative Studies, which is a legislative think-tank and highly rated academic institution that serves both National and State Houses of Assembly and even international legislators. All these agencies also have their capital budget including development of their headquarters, procurement of office equipment, procurement of regular items for running their offices; the National Assembly maintain legislative aides of about 3,000 in number, that aid the work of the Assembly; it also conducts regular public hearings involving the media and stakeholders and oversight activities, involving huge sums of money. “The cost implication of running the National Assembly is high because of the nature of our Presidential democracy. Then of course, there are 109 Senators and 360 members of the House of Representatives that require proper equipment to function effectively. They require adequate travel and transport support to carry out legislative functions. The National Assembly also has buildings and offices to build and maintain. National Assembly staff and members attend conferences, trainings, seminars to keep abreast of legislative developments worldwide. The activities are very encompassing and expensive. “It is also unbecoming of a former President to quote figures of sums of money that are factually incorrect. No member of the House of Representatives receives N10m every month. The salaries and allowances of members of the House are as determined by the Revenue Mobilisation Allocation and Fiscal Commission (RMAFC). Of course further sums of money are spent as running costs, that is, the cost of running the office of a member. “If a Minister, Chief Executive or Director in a Ministry travels on official duties, for instance, do you include the cost of his ticket and accommodation as part of his salary or allowances? Does the cost of stationeries and maintenance of equipment like computers used in their offices, form part of their salaries and allowances?